Arle is a small village in East Frisia. Today, only the size of its village church implies its former importance. In the past centuries, the area around Arle stood out due to its excellent farmland. It was said the best flax of all North Germany grew in Arle. As the demand for this versatile resource grew, the local farmers quickly became rich. The people of Arle had a considerably better life than the residents of any other place in East Frisia. In this game, you can share the fortune of living in Arle with the flax farmers of that time. 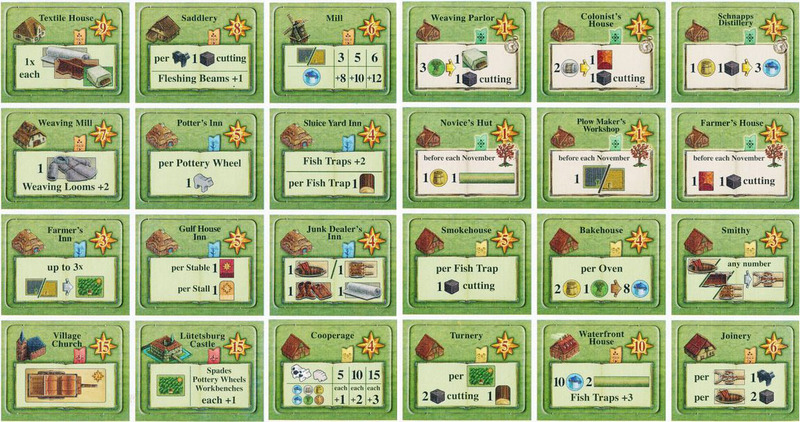 You can decide whether you want to participate in farming flax yourself or, as a consequence of the increasing wealth in Arle, meet the demand in other areas. You can grow grain, breed animals, cut peat, colonize the moor, or build dikes. You can cultivate forests, run a vehicle fleet, or build workshops and inns. Your biggest task is to build prestigious buildings like the previously mentioned village church. 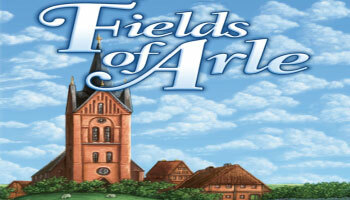 A game of "Fields of Arle" is played over nine half years - alternating between summer and winter. In summer, you can carry out different actions than in winter. At the end of each half year, there is a season-specific Inventorying. Finally, a single scoring at the end of the game will determine which player made the most out of the four and a half years he had in Arle. Place the Supply Board between you. Place the depicted tiles on the appropriate spaces as indicated on the Supply Board. (The Supply Board also shows a small illustration of the reverse side of each tile). Aside from your Home Board, you each receive a "Travel Destinations and Barn" Storage Board as well as a set of "Travel Destinations" in your player color. Place the Travel Destinations on the appropriate spaces of your Storage Board. Your Barn appears below the Travel Destinations, and it starts empty. You each receive an Overview Sheet showing the various actions of the game. During setup, place the Small Houses on the four spaces at the top of the Game Board (indicated by their green color). All of the Small Houses have the same building costs and are each worth 1 Victory Point (VP).